Alcoholic liver disease occurs after prolonged heavy drinking, typically for at least 10 years and particularly among those who are physically dependent on alcohol. However, not everyone who drinks alcohol to excess develops serious forms of alcoholic liver disease. It is likely that genetic factors determine this and a family history of cirrhosis may indicate a higher risk. Other factors include being overweight and iron overload (see information on Haemochromatosis). Women are more susceptible to alcoholic liver disease than men. Alcoholic liver disease may occur in people who drink 30g or more of alcohol each day (see section on Fatty liver for more detailed information. 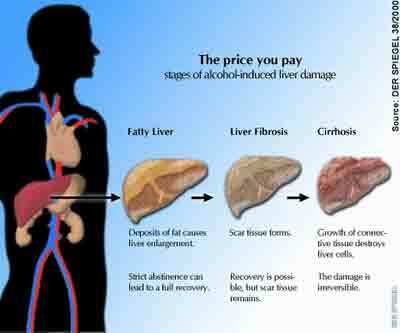 )Alcohol abuse can lead to the accumulation of fat within the liver cells. Management includes reducing alcohol intake and weight loss. Alcohol dependence needs to be recognized and dealt with. Fatty liver can lead to inflammation and eventually scarring of the liver and cirrhosis. Anything which results in severe liver injury can cause cirrhosis. Common causes include excessive alcohol intake, chronic hepatitis B and C infection, intake of certain chemicals and poisons, too much iron or copper, severe reaction to drugs. Although cirrhosis in general is not reversible, people who stop drinking may avoid progression to liver failure and/or liver cancer. The liver is a very long-suffering organ and can recover from a lot of abuse as long as the damage is not too advanced. However, by the time the liver starts showing signs of distress, the cirrhosis is often too far advanced and the only prognosis is death or a transplant with a lifetime on anti-rejection drugs. Until recently there has been no cure for liver failure, except for a transplant, which was not always available for long time alcoholics. At this point, treatment was mostly supportive and often included adherence to a special diet, diuretics (fluid tablets) and abstinence from alcohol. The great news is that new advances in stem cell research are promising new hope. Those patients who could benefit from this treatment and are lucky enough to be hospitalized in areas where the technology has advanced this far are being offered cutting edge treatment which might possibly reverse the damage their organs have sustained. This is great news for people facing liver failure. It will only work however, if the patient manages to beat his or her alcoholism, so other measures must be taken to assist the patient to recover from this addiction. Stem cells from the patients own body are now being used to cure cirrhosis of the liver by harnessing nature’s own repair mechanism. Stem cells extracted from patients' bone marrow are being used to generate new tissue in damaged areas. In other trials stem cells are being extracted from the blood and injected into the hepatic artery in the liver. This process takes place using only a l ocal anesthetic and the seriously ill patient does not have to undergo invasive surgery, making his chances of making a full recovery even better. This new treatment is offering hope for sufferers; however, the prognosis is only good if they can overcome the psychological problems that caused them to drink in the first place.